Mazel tov to Carol Zoref! 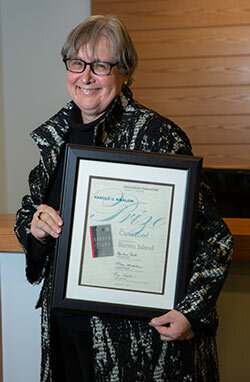 On January 31, Hadassah Magazine presented the author with the Harold U. Ribalow Award for her novel, Barren Island, at a ceremony held in New York. Despite the frigid weather outside, the professor and director of the Writing Center at Sarah Lawrence College was feted in an especially warm reception attended by colleagues, family and friends. Speakers at the event included writer Melvin Jules Bukiet, a fellow Sarah Lawrence professor and friend to Zoref; Leah Nadich Meir, a Ribalow family member; Hadassah Magazine’s executive editor, Lisa Hostein, and chair, Marlene Post; and Hadassah Executive Director/CEO Janice Weinman. Barren Island is a vivid work of historical fiction in which Zoref deftly explores immigrant life, poverty, left-wing politics and religion through the coming of age of the narrator, Marta, in the first half of the 20th century. Read an excerpt from the novel here, taken from the book’s opening in which Marta describes her childhood spent on an isolated island in New York, where members of her immigrant Jewish family worked in a glue factory. To learn more about what inspired Zoref to write Barren Island—and what she’s working on next—please read our Q&A with the author. Hadassah Magazine’s annual literary award—presented to an author who has created an outstanding work of fiction on a Jewish theme—was established in 1983 by the friends and family of the late Harold U. Ribalow. As an editor, writer and anthologist known for his passion for Jewish literature, Ribalow especially enjoyed promoting the work of new writers. He himself was the author of some 15 books that shared in common aspects of Jewish interest but which covered a wide range of subjects. In addition, Ribalow was the founder and editor of Hadoar, for many years the only Hebrew weekly in the world outside Israel and a member of the Jewish Academy of Arts & Sciences.